For a few decades we've been tube nutters inside and out. Even before the hifi bug bit and infected both of us with an incurable case of serious audio disease, things had to have tubes. No guitar amp was even considered if there were no tubes aglow. Listening to music from the airwaves had to be by means of a tube radio. Our first real investment in audio after many a DIY and restored second-hand project had to be in a SET – and one inspired by the late Dr. Gizmo no less. We lived happily ever after listening to all manner of music through tube amplification, eventually even upgrading our setup with high-efficiency big hornspeakers to match. We reviewed our fair share of solid-state amplifiers but were always happy to revert to our trusted own glowing bottles. Rolling 300Bs, 6SN7s and what not—thus adapting the sound of the system to a certain mood—became second nature. When tube amps came in for review there were glory days and parting with them afterward was not always easy. This changed when the Devialet D-Premier arrived on the scene. 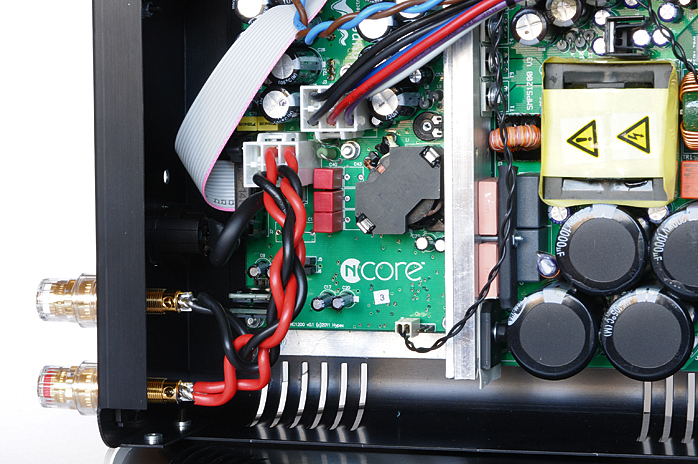 Not only is it an all-in-one phono stage, preamp and streamer but a hybrid class A/D power amp as well. Over the years we auditioned a number of class D-based designs and had mixed feelings. There always was something uncomfortable in the music reproduced. Exceptions were class D amplifiers mounted in a wooden enclosure. Somehow the wood’s natural filtering took off the nasty edges. With the Kharma MP150 a similar effect was achieved by loosening one of the screws on the bottom to let the amplifier breathe. The Devialet however is not a real class D amplifier. The sound and textures all derive from its tiny class A amplifier circuit. The hybridized class D follower stage simply boosts it. The best part of that unusual arrangement is that this follower neither adds nor subtracts anything. It simply boosts the class A signal. And boy what a great job it does of it. 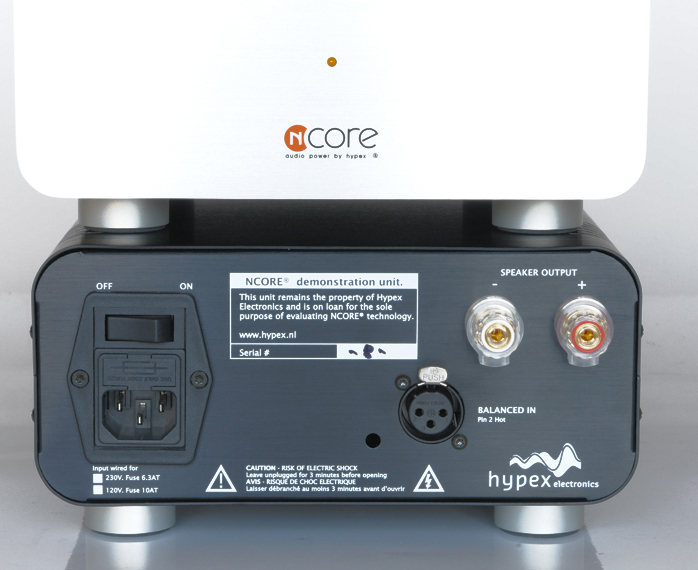 At this point in our tubes/class D evolution, Hypex announced their new Ncore® amplifier module with the byline 'world’s first audiophile class D power amplifier'. This triggered our attention to the utmost for two reasons. One, that line comes from Hypex. 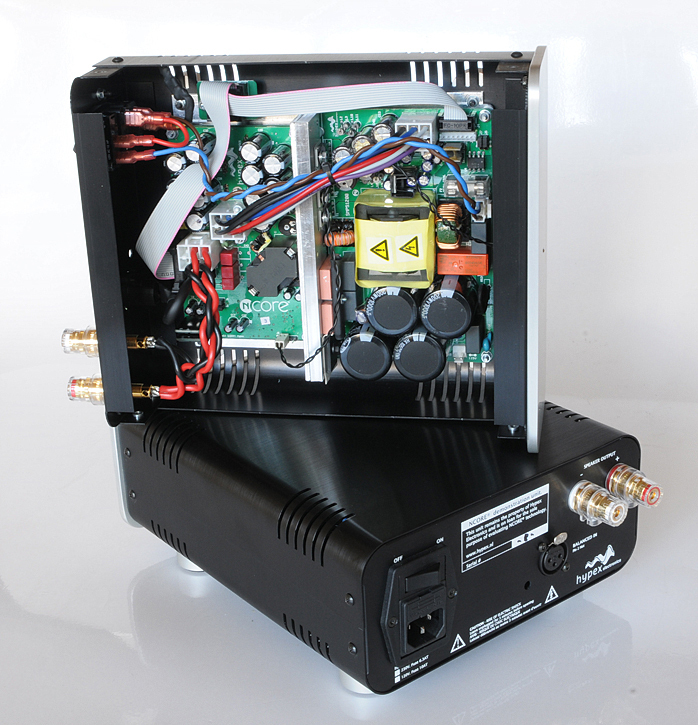 Hypex is a well-known OEM supplier of class D amplifier modules and outfits many manufacturers with quite a reputation in the amplifier arena. The above mentioned Kharma amplifier was build around a Hypex UcD module just like certain Channel Islands, Meridian, Hexateq and Genesis Reference amplifiers. Were all these UcD based devices suddenly declassified from being audiophile? Two, the tag line uses the word ‘audiophile’. We know the wizard of Class D Bruno Putzeys as the engineer at Hypex. With to him good reason, Bruno does not believe in anything audiophile. If you can measure something it’s there and if it’s there you can measure it. That’s his credo. Now according to the Ncore® white paper, Bruno had dreamt up a new technology taking the proven UcD platform—Universal class D—by adding a load of improvements. 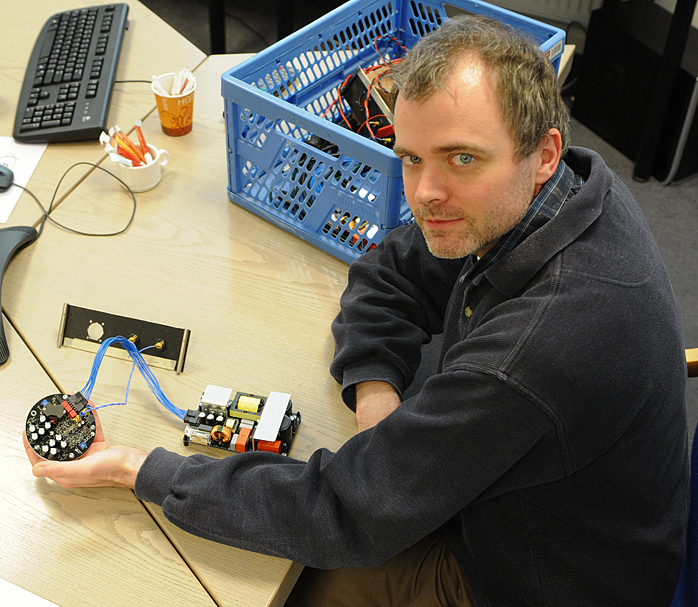 With Ncore® Bruno went a step further in understanding how a self-oscillating circuit behaves mathematically. In this arena he is one of the very few who really grasps how these things work. This enhanced insight has led to improved large signal handling. Another improvement became the comparator where the PWM signal is created by means of comparing the input signal to the signal of a high-frequency triangular wave generator. Bruno moved the comparator’s behavior much closer to his theoretical model. Other improvements derive from further distortion reduction and a redesigned control loop that adds 20dB of gain whilst maintaining absolute stability. Not that we can fully grasp what’s going on with Ncore® even though the Hypex white paper explains these improvements in quite some detail. The bottom line which we do understand completely is that this power amplifier module is ultra linear, has noise and distortion levels that are next to non-existent to beat even the highest-quality class A or A/B amplifiers and on top of that can handle the most difficult loudspeaker loads due to ultra-low output impedance. Essentially on (the white) paper Ncore® technology promises (or threatens) to end all fun of audio reviewing. We can see Bruno laughing when he wrote that piece. So we bit and took the challenge. We asked Hypex whether we could have a test drive with their new modules. They agreed and soon two complete power amplifiers arrived at our door step. For evaluation purposes Hypex has built some Ncore® NC1200 circuits and packed them with an SMPS1200A700 power supply into 25 x 21 x 10cm generic enclosures. 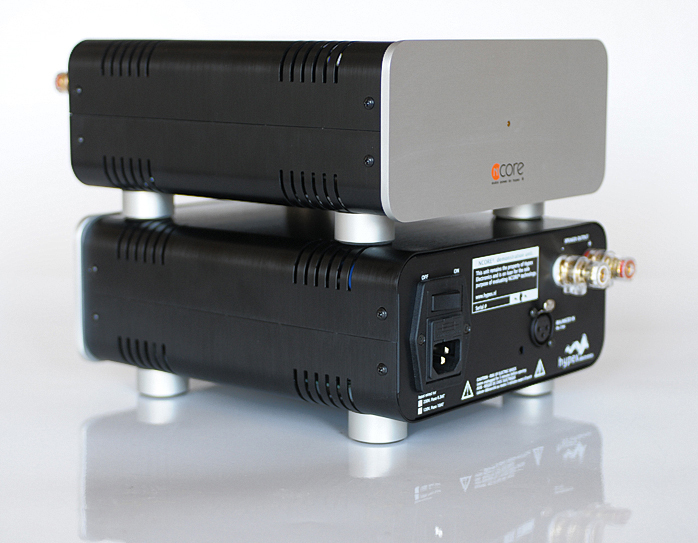 This combo is capable of delivering 350 watts into 8 ohms, running up to 1200 watts into 2 ohms. 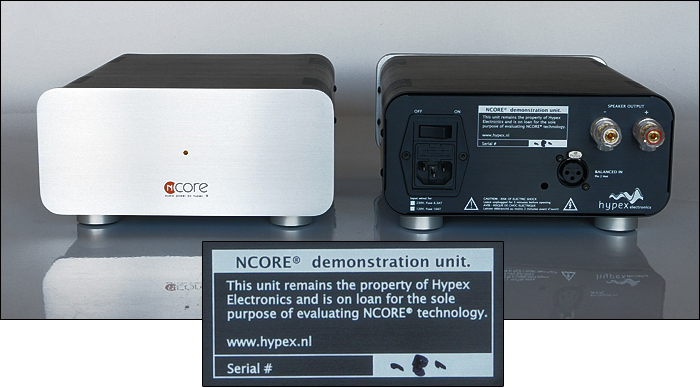 At the back of the only 2.5kg amplifiers we received one message loud and clear - these units are on loan and strictly for Ncore® technology evaluation. In other words, they are not for sale in any way. These eval units accept only balanced inputs and their speaker terminals are five-way WBTs. A generic switched IEC power inlet completes the socketry. Inserting these amps into the hifi system was quite the relief compared to earlier behemoths. Some of those we actually could not carry upstairs. We had to revert to long loudspeaker cables running through the ceiling to reach the loudspeakers from the ground floor. Here we just had to take care of 5 kilos total. Connection was a cinch with a PS Audio PWT as CD player and the PS Audio PWD as DAC with adjustable output to do without a preamp. The first loudspeakers were the Vaessen Aquarius. As this isn’t a formal review—the Ncore® amplifiers are not (yet?) commercially available—we can make this brief. These amplifiers are phenomenal. From simple Rock to the most complex symphony orchestra scores with choir and at any conceivable SPL, there was complete and utter control over the loudspeakers. Tonality was rock stable from the lowest to the highest volumes. In another setup we used a Devialet as DAC/preamplifier to add a vinyl source. With the 100dB sensitive Pnoe horns, the Ncore® devices demonstrated absolute quiet. No hiss, no hum, no other unwanted noise, just the music. Into this 16-ohm load the amps didn’t need to do much but what they did was very impressive. Bruno was right. There isn’t much to say about their sonic character. There's no goose bump effect—read sympathetic distortion— no euphonically induced heart palpitation. There’s just the music as is appears on the CD, LP or hard drive. The only influential players in the sound field remaining are the listening room followed by the loudspeakers and other electronics. With those in the loop, there remains plenty to write about in audiophile terms. So our days are far from over. 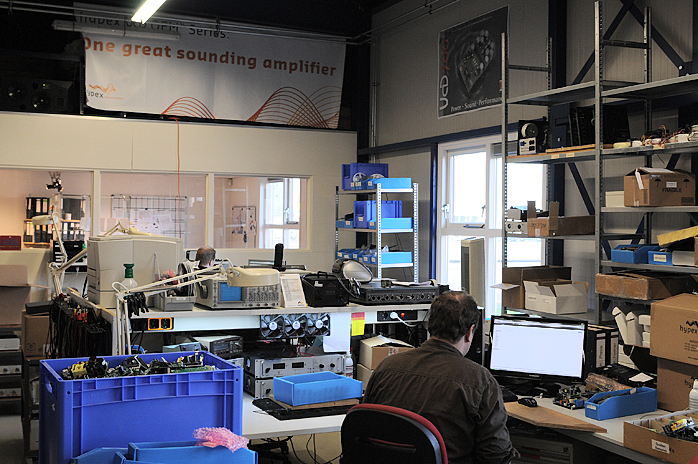 While happily listening to the Ncore® amps, we thought it was time to meet their makers. 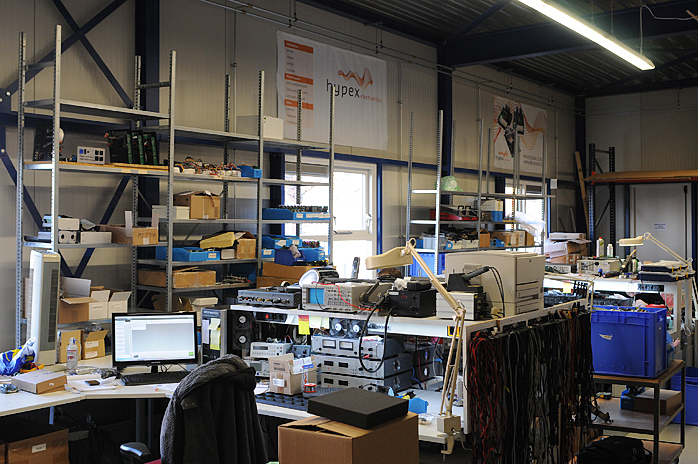 We made an appointment to visit Hypex in Groningen, a mere two-hour drive to the north of Holland. 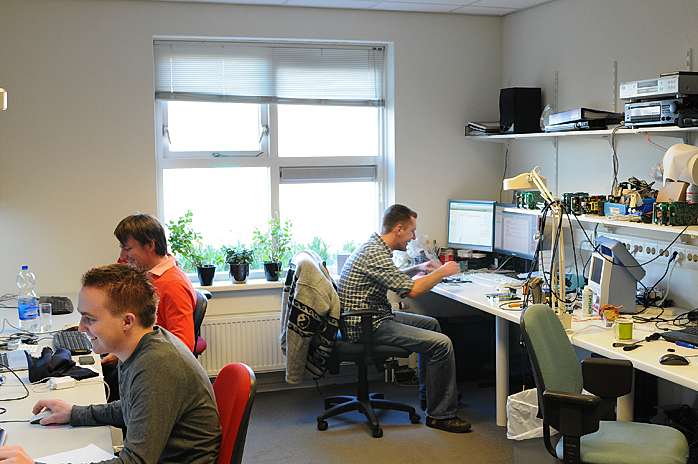 Hypex HQ is housed in a friendly one-story brick building in an industrial zone. 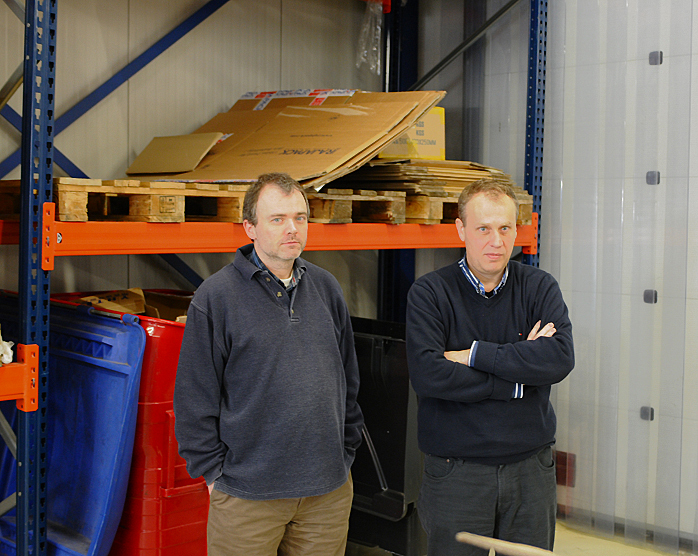 Meeting us were owner Jan-Peter van Amerongen and chief engineer Bruno Putzeys. Over coffee Jan-Peter told us a bit about the origins of Hypex. Way back in 1996 it all began literally in the attic of his house where he built his first pro-audio amplifiers like for example a 750-watt monoblock meant for active loudspeakers. Other projects were plate amps for home-theater subwoofers. This was quite successful and two years later the first real business could open in a dedicated location which in 2003 was followed by a move to the current location. Meanwhile Bruno was working at Philips where he also did some work for OLS, the mother company of Charles van Oosterum’s Kharma. In that position Bruno came in contact with Jan-Peter by 2001. Bruno by then was working on a new class D design for Philips and told Jan-Peter how this was becoming a very interesting development. The moment the UcD-baptized design was presentable, Jan-Peter drove down to Bruno's Belgian hometown of Leuven to hear and see what this new technology was all about at the local Philips research facility. According to Jan-Peter it took all of 30 seconds to become convinced of UcD’s potential. A few images on a scope later and Jan-Peter was completely sold. 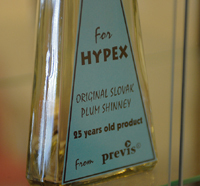 After this initial encounter with UcD, Jan-Peter made a deal with Philips to use their technology in Hypex products. 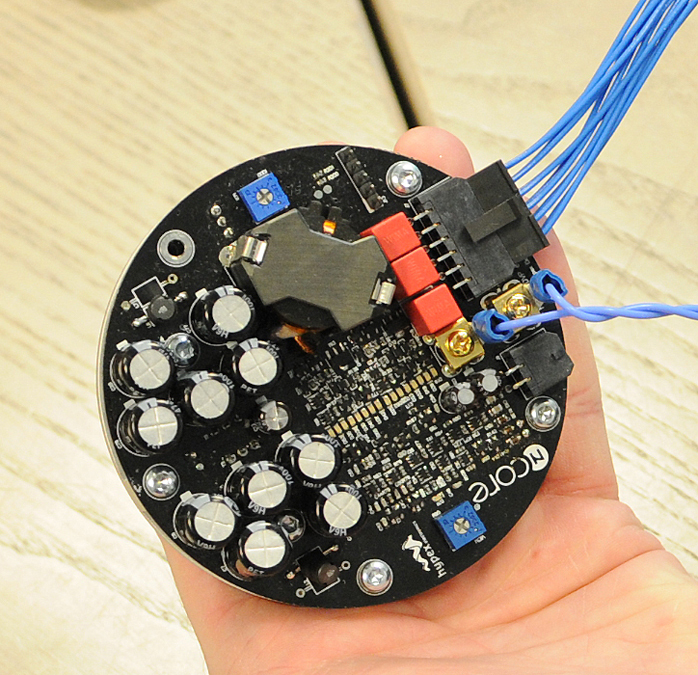 With the acquired 150-watt UcD reference in his pocket, Jan-Peter started designing and building the first Hypex UcD180ST module. In 2004 these were marketed and used in Hypex-built subwoofers. In the same year the 180ST gained company from the more powerful 400ST. Unfortunately a year later Philips decided to freeze funding for Bruno’s R&D department. This signaled Jan-Peter that it was time to ask Bruno if he would join him in Hypex. 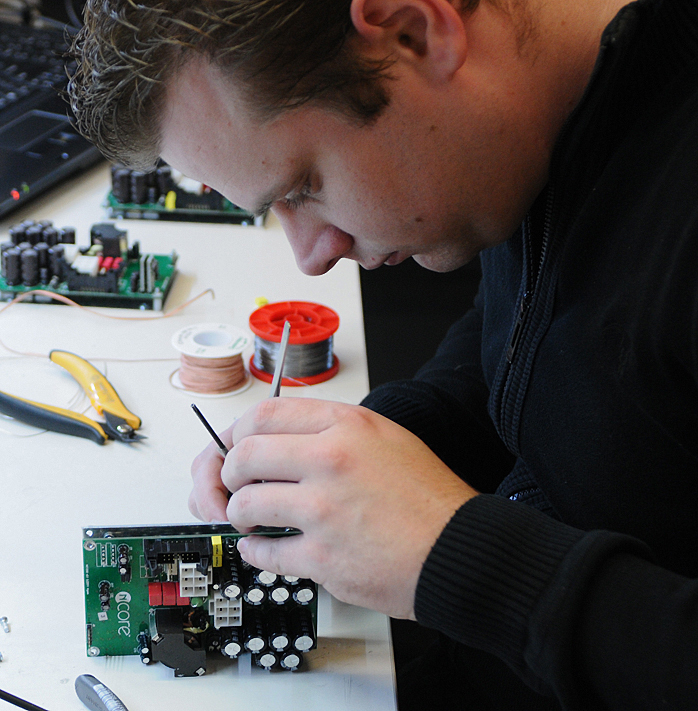 Not only did Bruno make the move, Nand Eeckhout also left Philips to join the Groningen company. Nand designed his first class D module at age 17 and worked as an intern during his electronics study at Bruno’s Philips department. 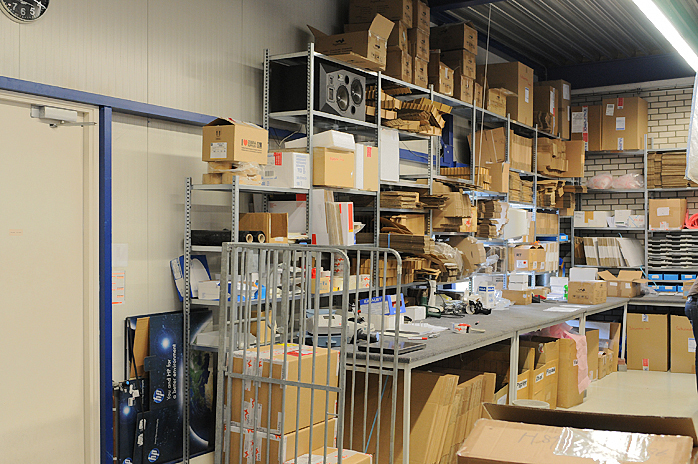 Nand now is in charge of the switched power supply department at Hypex. 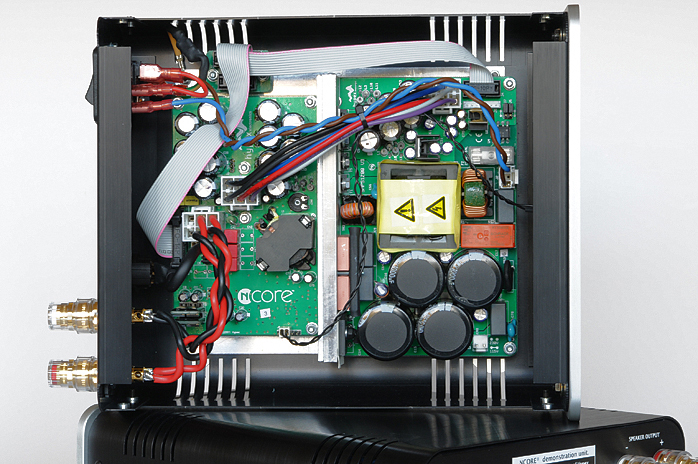 The development of the next generation of amplifiers now known as Ncore® began in 2008 but got delayed a bit because what had to happen first was setting up a volume production infrastructure for the UcD modules. There was market demand for literally 10s of thousands of UcD modules each year and that volume proved impossible to achieve in Holland. After careful decision making production now occurs in China and Slovakia. All finalized modules ship to Groningen where final quality control takes place before the modules are shipped around the globe. Logistics are now a main part of the Hypex enterprise. 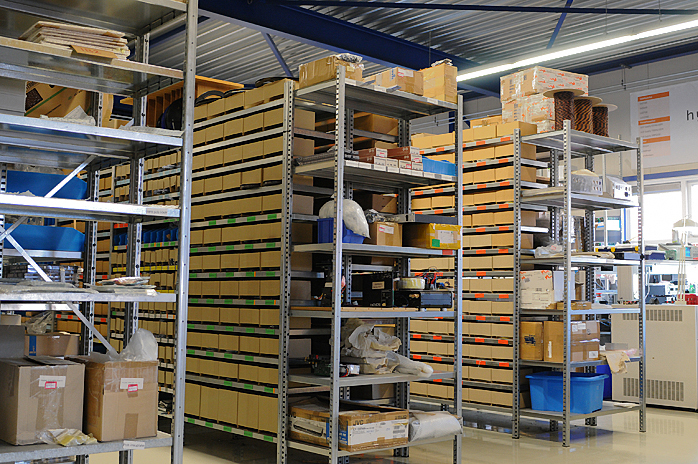 Their Groningen warehouse is crammed with parts to form a buffer for non-stop production capability. 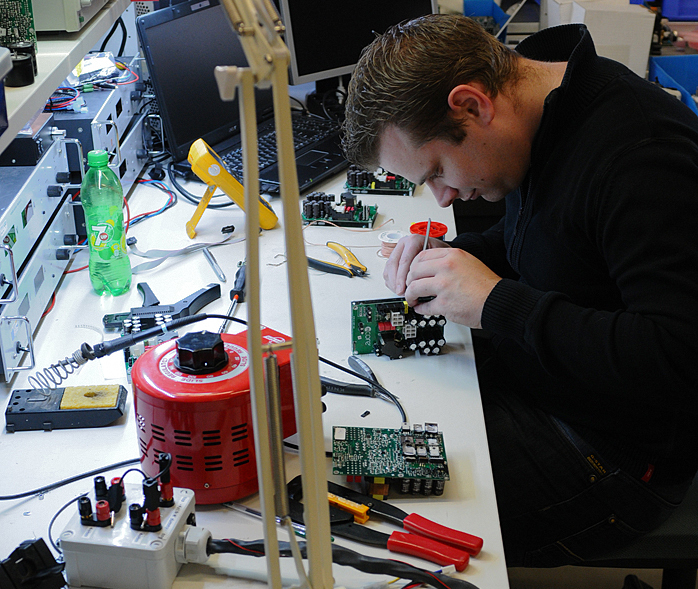 With the UcD production facilities in place, the work on the Ncore® development could proceed. This culminated in the first prototype by the end of 2008. 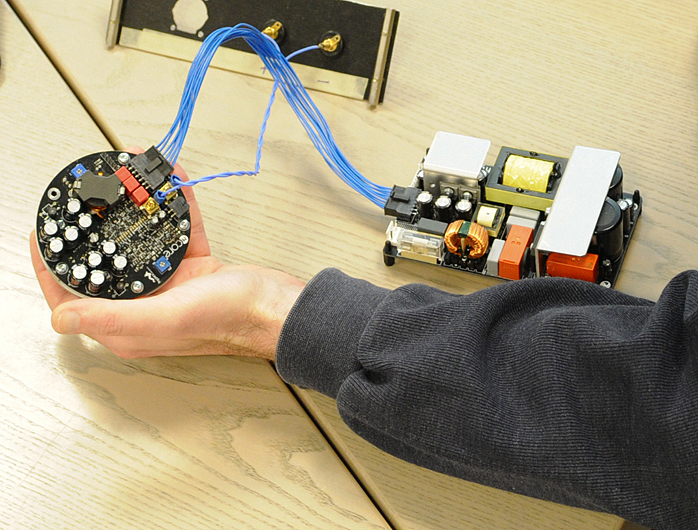 The fully developed NC1200 module finished around the summer of 2010. Development was challenged when the measuring devices failed to cope with the extremely low distortion figures. Their own higher distortion got in the way of what was supposed to be measured. Besides the NC1200 to be offered to the professional (OEM) market, Hypex also designed and built the smaller NC400 module specifically for the hobbyist market. The first batch of these sold out in less than 5 hours once the news spread via the Internet. It took only 5 minutes between the relevant update of the Hypex webshop pages before the first order arrived. The DIY market is very dear to both Jan-Peter and Bruno and they support the community as best they can. Check out the various forums where Bruno gives free advice and guidance if you’re curious. That Bruno isn’t a nerdy textbook engineer is proven by the layout of the NC400. Why settle for square circuit boards if you can go round? So Bruno did just that with the NC400. But it’s not merely about the shape. As he says, he built up the circuit with discrete components only. There are merely transistors without a single integrated circuit - just for fun and to beat the best IC. In Bruno’s view ICs introduce distortion and that was not acceptable. So now there is an iconic class D module for the do-it-yourselfer that marks the point where class D has finally grown up. 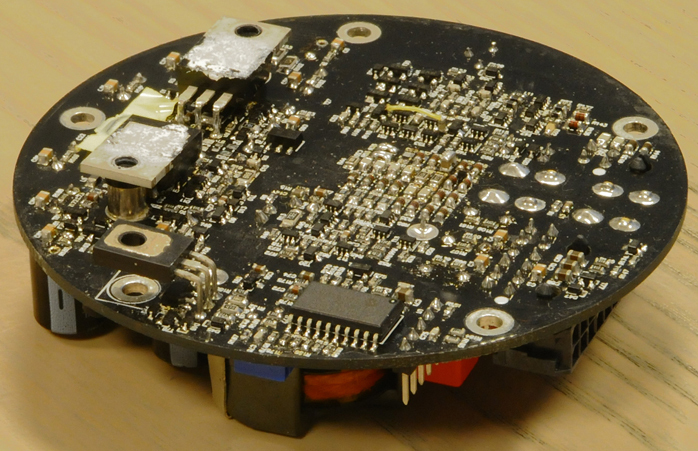 The NC400 module in the earlier photos is a prototype and completely hand-populated. Freedom in both a financial and technical sense is what drives Hypex. In such an environment beautiful things can happen when nobody looks in from the outside trying to control you. As a consequence there is no discount system for the DIY market. Pricing is straightforward and fair. That same freedom makes it possible to serve the DIY market with the NC400 modules first and only later attend to the OEM market. Once the OEM market opens up, its customers will only get the modules as is. Hypex will not customize any of them. That’s freedom of action. This mind set also drives the development of new Hypex products. There’s plenty of room for anyone there to improve anything. One of Bruno’s goals is to look for hidden elegance. He's now on a quest for new views and insights. A palpable result is his deepened PWM modulation theory. Bruno wants to write a simplifying paper for the IEEE that explains PWM as a phenomenon. In his native Flemish there is the word hoekske—little corner—where Bruno is looking for something new and unexplored. Ambition to his mind is a great good but should be combined with a certain perkiness. Another subject of Bruno’s ongoing curiosity is proof how there is no physical limit to class D. There might be a limit to a given circuit implementation but not to what the inherent technology is capable of. Though this designer is full of ideas, it remains a bit lonely at the class D development top. Here there are only two real developers in the world. 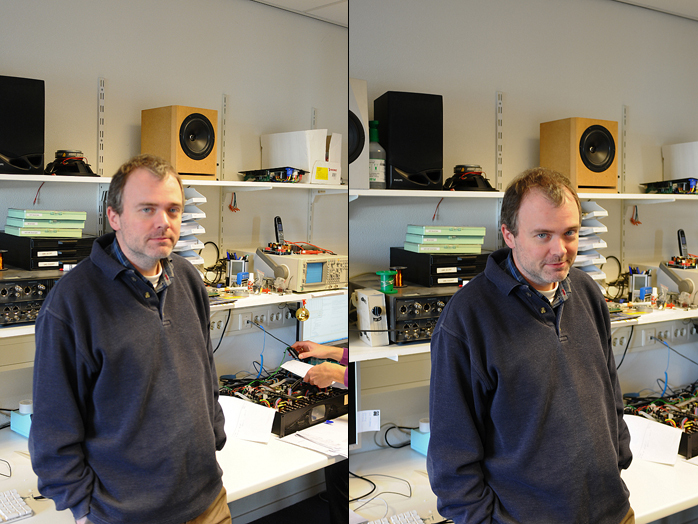 One is Bruno, the other is Lars Risbo at Texas Instruments in Denmark. Bruno compares his research efforts to a time trial in the Tour de France. You are racing against an unknown opponent to reach the goal first. In class D there might be an unknown designer somewhere with a brilliant idea who did not surface yet. But things are not as tunnel-vision as they seem. For Bruno there is life after self-oscillating amplifiers. To protect his ideas as well as possible, a patent on Ncore® technology has been filed also in the US. Before the Ncore® name got stamped on the circuit boards and business stationary, many other names came to mind. Finally the name was derived from the most important part of the circuit, the modulator heart. Bruno came up with the name and also drew the accompanying logo. As he put it, "to keep things simple, do it yourself but do it good".